This bushy, 1 1/2-2 ft. perennial is prized for its large, flat-topped clusters of bright-orange flowers. The leaves are mostly ﻿alternate,﻿ 1 1/2–2 1/4 inches long, pointed, and smooth on the edge. The yellow-orange to bright orange flower clusters, 2–5 inches across, are at the top of the flowering stem. The abundance of stiff, lance-shaped foliage provides a dark-green backdrop for the showy flower heads. This showy plant is frequently grown from seed in home gardens. Its brilliant flowers attract butterflies. Because its tough root was chewed by the Indians as a cure for pleurisy and other pulmonary ailments, Butterfly Weed was given its other common name, Pleurisy Root. Although it is sometimes called Orange Milkweed, this species has no milky sap. Soil Description: Prefers well-drained sandy soils. Tolerates drought. 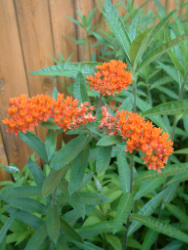 Conditions Comments: Butterfly ﻿﻿weed﻿ has an interesting and unusual ﻿﻿flower﻿ ﻿structure. Plant it among other mid-sized perennials. Inevitably butterfly ﻿weed﻿ will get aphids; you ca﻿n leave them for ladybugs to eat or spray the insects and foliage with soapy water. Aphids can also be removed by blasting the plant with a high pressure stream of water. Description: The easiest method of propagation is root cuttings. In the fall, cut the taproot into 2-inch sections and plant each section vertically, keeping the area moist. Seed Collection: Watch plants closely for seedpods in late summer/early fall. Allow seeds to completely mature before collecting seed to establish new plants in another location. A long pod is produced containing hundreds of seeds with tufts of long, silky hairs (an adaptation for wind dispersal). Maintenance: Needs to be transplanted carefully and requires good drainage. It takes 2 – 3 years before A. tuberosa produces its vibrant flowers, which appear in 2 – 3 inch clusters of orangish-red. Once established, it lasts for years, becoming thicker each year.